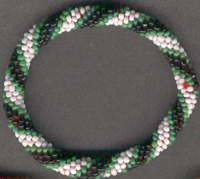 All bracelets were strung in a pattern with seed beads (unless stated otherwise), then crocheted in a spiral. 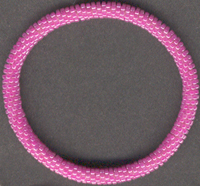 Due to the crochet technique, there is very little stretch to these bracelets - they will slide over a hand that is 8 1/2 inches around its widest part - be sure to measure before ordering. 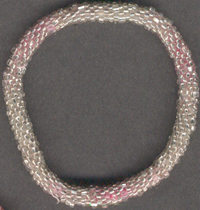 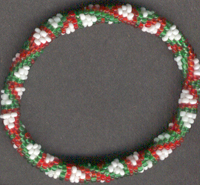 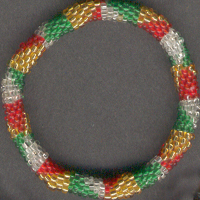 This bracelet was beaded in a red, green, and white shifting, outlined triangle pattern. 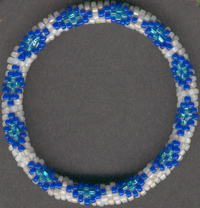 This bracelet was beaded in a blue, turquoise, and white diamond pattern. 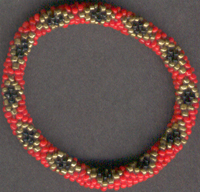 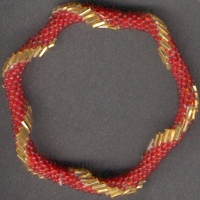 This bracelet was beaded in red beads with gold bugle beads creating a 3-dimensional spiral effect. 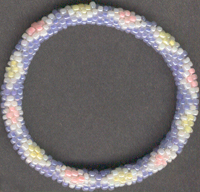 This bracelet was beaded in an alternating yellow and peach diamond pattern with white outlines and a periwinkle background. 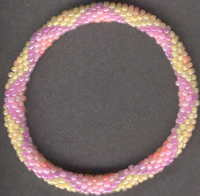 This bracelet was beaded in a yellows and pinks interlocking diamond pattern.